100 days. Cucumis melo. Open Pollinated. 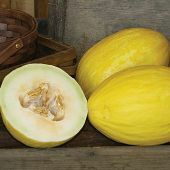 Plant produces good yields of 4 to 6 lb yellow melons. The flesh is white pale green and is very sweet. Great addition for any fruit salad. Stores well. Excellent choice for home gardens and market growers. 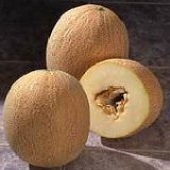 Also known as San Juan Canary Melon, Spanish Melon, Jaune des Canaries Melon, and Huane de Canaria Melon. A variety from Europe. Plant seeds directly in the garden. Plant the seeds 1 when soil has warmed up. The seeds may rot and not sprout if the soil is too cool. Germination is improved when soil temperature is above 60 F. Plant the seeds in hills. Plants grow 1 ft tall and vines spread up to 10 ft. Requires fertile slightly acid soil in a well drained location in the garden. Apply much and grass clippings, or straw around base of plant. Water well during dry and hot spells. Make sure plants get 1" water per week. 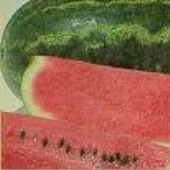 Protect ripening melons from damp ground by placing them on boards. 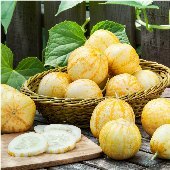 Cut melons carefully from plants to prevent damaging the vines.